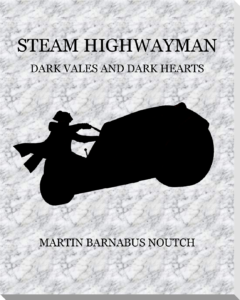 Who is the Steam Highwayman? YOU are the Steam Highwayman! 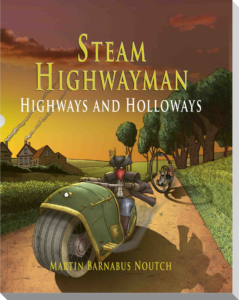 Steam Highwayman is an Adventure Gamebook in which the reader explores an alternate 19th century England mounted on a steam motorbike, robbing, duelling, discovering and rescuing. You choose your own destiny: will you side with the Compact for Workers’ Equality and work to bring about revolution in England? Will you find a place in high society and become famed for your gallantry and style? Will you find your own path through the smog of the cities and beneath the branches of the quiet woods? The volumes of the series create an open-world, freely-explored, interlinked adventure, with solo-rpg and gamebook features. With dice and pencil you can track your career as the Steam Highwayman – whoever you choose that to be! So far the first two volumes have been published with crowdfunding through two successful Kickstarter campaigns – you can find out on the relevant pages below. I also perform interactive readings as the Steam Highwayman at various Steampunk, Gaming and bookshop events. The woods and villages resound to the roar of a powerful Ferguson velosteam: a ruthless outlaw terrifies the rich, comforts the poor and challenges the Constables. Marlow, High Wycombe and Maidenhead are all explorable, together with countryside between. Will you gain an invitation to the illustrious Cliveden Ball? Will you take the cup in an exciting steam-car race? 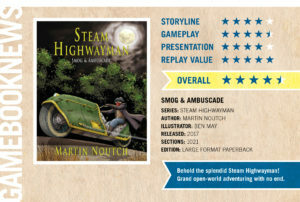 Steam Highwayman was funded on Kickstarter in 2017. Nowhere is safe from the sudden assault of the Steam Highwayman: the airship crews of the Atmospheric Union have been robbed and one of their airships has been highjacked. The nobility of Henley, Wallingford and Reading quake in fear – are their grand houses the next to be set aflame? Steam Highwayman II was funded on Kickstarter in July-August 2018 by 225 backers, reaching 159% of the funding target! The Steam Highwayman comes to the Imperial Capital of London! Reform or revolution? Engage in the intrigues of court, duel with Members of Parliament and speed the revolution. The Reeking Metropolis is a work in progress. Subscribe to this website to hear about my plans and to share what you think are the unmissable sights of steampunk London. 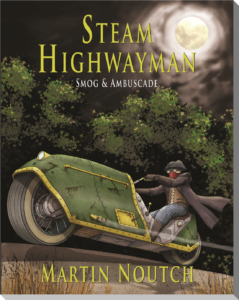 The Steam Highwayman travels to Devon and Cornwall and encounters a tyrannical warlord. Will you find employment as a trusted lieutenant, or will you choose to infiltrate and assassinate? In Wales the Steam Highwayman will come face to face with the heart of Imperial industry, as well as direst poverty, a religious revival, an ancient and reclusive culture and the imposing mountains of Snowdonia. The Civil War in the North has dragged you in: a cold winter promises suffering across the land. The anarchists look to destroy and remake the nation in fire. Who is the maker of the Clockwork Birds? Can York be saved? Where is the best pork pie on the Great North Road?